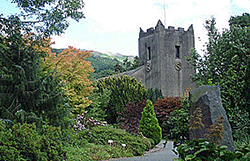 St Oswald’s Church in Grasmere celebrates its patron saint on the nearest Saturday to his feast day of 5th August. Children and choristers parade through the village to the church carrying traditional ’bearings’ - large decorations on biblical themes made from rushes and flowers. After the procession and a special service in the church, the participants indulge in pieces of Grasmere gingerbread, each stamped with an image of St Oswald. I can confirm that Grasmere gingerbread is like no other and their recipe is a closely guarded secret. There are many recipes that purport to be the ‘Grasmere’ version but the one here is the one that comes closest to the real thing in my view. Put shortbread, sugar and 2 teaspoons of ground ginger into a food processor and process to crumbs. Reserve 3½oz (100g) of the mixture. Add the remaining ground ginger, mixed peel, crystallised ginger, flour and baking powder to the processor and pulse until well mixed. Melt the syrup, treacle and butter in a saucepan that is large enough to take all ingredients. When melted, add the mixture from the processor and mix thoroughly. Turn in to a lightly greased Swiss roll tin and press down with a spatula (or a potato masher works well) until dense and flat. Put in to the oven and bake for 10 minutes. Remove from the oven and sprinkle the reserved crumbs over the top and press down firmly . Cut into good size pieces with a sharp knife and leave to cool in the tray. This can be frozen but it is at its very best on the day of baking.